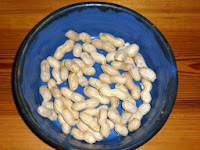 My new life in Burgenland: Bob and I Discover Real Peanuts. Do you even know what a peanut still in it's shell looks like? Since my discovery on Saturday the two of us could be mistaken for a pair of monkeys. The supermarkets are running a special on peanuts. The hulled kind. 1 kg for Euro 3,99 and when you consider that shelled almonds sell for over 2 Euros for 200g, buying a bag of peanuts made sense.
" Why didn't you get almonds? " oh well at least I would have the whole packet to myself. With great foresight, I put a piece of paper over the keyboard and proceeded to shell peanuts and puzzle online. It only took the first shelled peanut to make me a fan. Oh my gosh, how divine. Tasty and oh so moreish. Cracking the shell ( and I found I could do it with one hand ) made a bit of a crackling noise and sure as nuts, it attracted Bob. When I came back from a bathroom break, there he was with his own bowls of peanuts.
" These remind me of my childhood and how we ate them at the Durban harbour. If my Dad were here, he would finish the whole packet." Bob has also discovered that making peanut butter is really easy and so a trip back to the store for a few more bags is inevitable!